Easter Bunny has arrived to us! Welcome to our home, Easter Bunny! 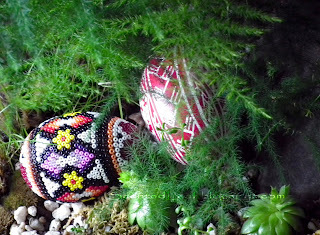 Well, we had a huge turn out when saw the white rabbit in the hideout of miniature roses and the eggs all over around... We will let them hidden in our miniature landscapes till Easter Sunday morning. I want to mark an upcoming sale event in Vancouver's events calendar: Saturday May 7, 2011 will be Annual Plant Sale & Show of the "Canadian Geranium & Pelargonium Society"
The event is One Day Only and will be held on the Saturday of Mother's Day weekend from 10am to 4pm at the Floral Hall, VanDusen Garden, 5251 Oak Street at 37th Avenue, Vancouver. 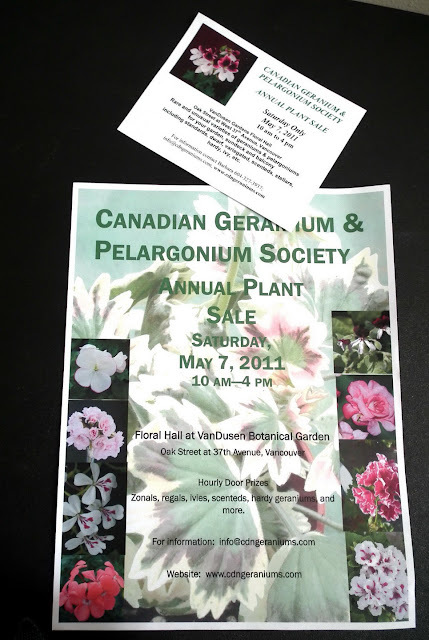 Believe me - it is a great opportunity to see a wide variety of common or unusual pelargoniums and geraniums; to win Hourly Door Prizes and to buy stellars, regals, angels, fancy leaf, zonals, ivy and scented species or standards hardy geraniums / pelargoniums for your garden. The 2011 Sale posters and flyers are already posted in the main tourist places around Vancouver (we distributed some in Downtown Vancouver and Stanley Park area). 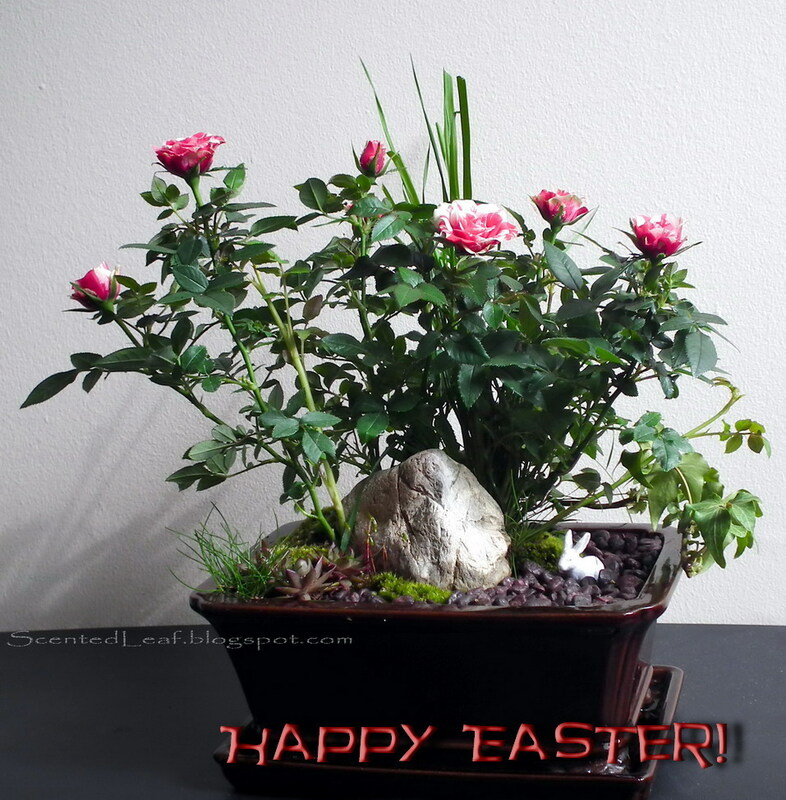 We prepared last week one miniature garden in a bonsai pot ( to be sure that to the event the plants are stable after transplantation) for the hourly door prizes. We planted a regal pelargonium with a lot of flower buds which perhaps will be in full bloom on May 7th with a lot of dark purple flowers. Two days before show I'll give the final retouch to this miniature garden (perhaps I'll refresh the moss and few accent plants). 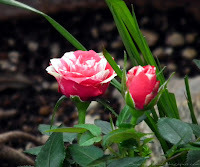 I wish YOU to be the lucky one to win our "mini-garden prize" at the sale event! 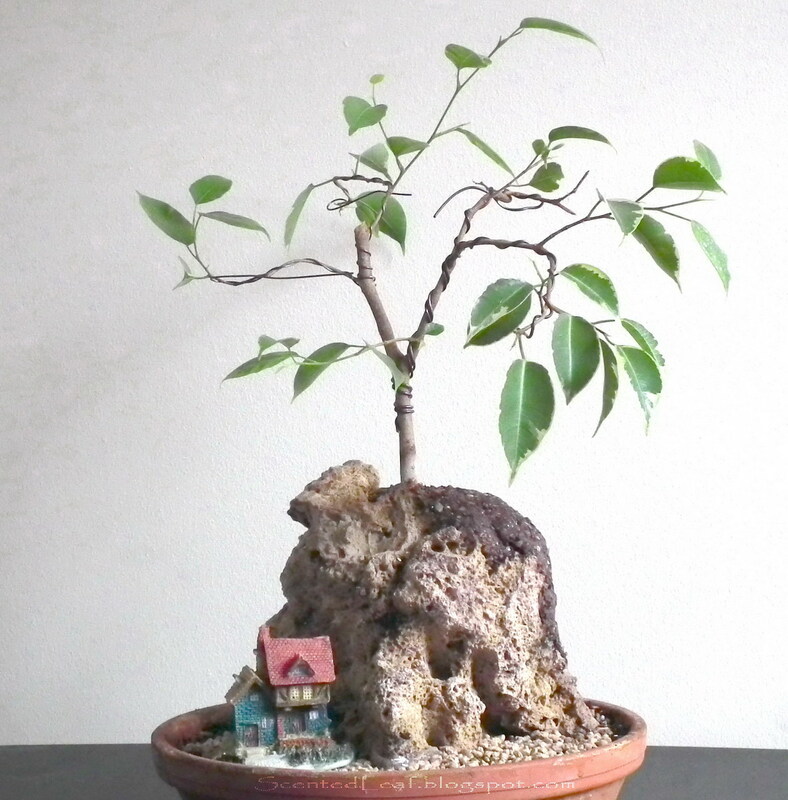 The idea of growing small Ficus prebonsai as addition for any reptile & amphibian terrariums was given us by a friend. 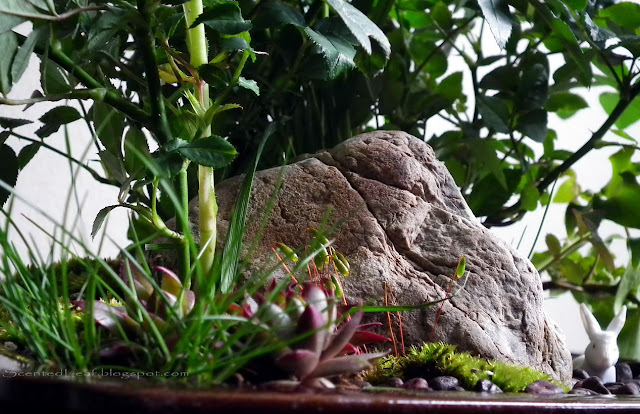 He built an Organic Living Diorama Terrarium / Vivarium in an old 80 gallon aquarium with succulent plants, some assorted Tillandsias (air plants) and some varieties of ferns and tropical plants like "Purple Passion Plants", "Peperomia" "Bromeliads" and "Earth's Star". He explained us about terrarium, vivarium, riparium, aqua-vivarium, paludarium :-)... and how he set his living Diorama. Also he explained how the tropical plants and potted plants can aid the amphibians in breeding them (Mother Nature has a solution for everything). He intend to transform a little bit his chameleon vivarium / terrarium by adding a potted ficus bonsai to the existing plants, eventually making a tropical forest. 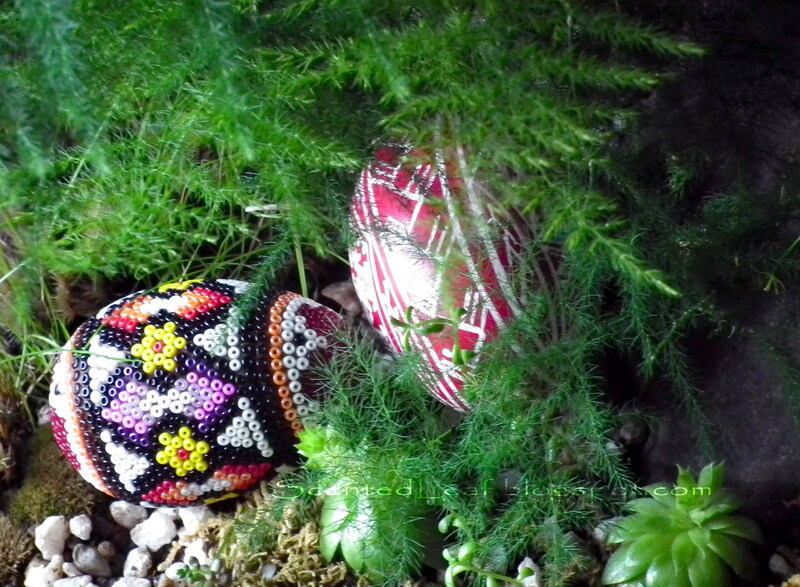 He likes our plants because are pesticide and fertilizer free, an essential condition to any plant used in making terrariums in order to keep the reptiles and amphibians safe. Initial he was attracted by Ficus Wiandi variety because its small leaves provides lots of hiding materials to his Chameleon... 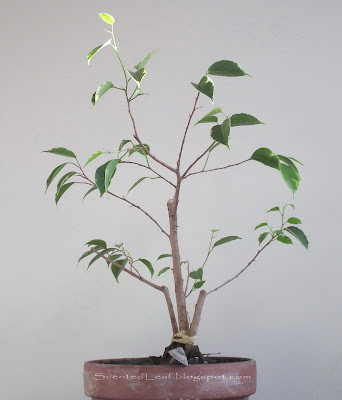 He consider also Ficus Benjamina Variegated leaves a beautiful addition to any terrarium ... which will make a nice forest dwelling to any reptile or amphibian. So... we have been played a little bit with some of our tropical plants in order to determine which one has the dimensions more appropriate with his aquarium... A perfect fit seems to be one Ficus Wiandi prebonsai with two branches which grown opposite one to another, almost parallel with the soil ... with a compact canopy of leaves at 10 cm high to the soil surface and decided that it is more suitable to be used in a smaller terrarium, perhaps one of 20-30 gallons. 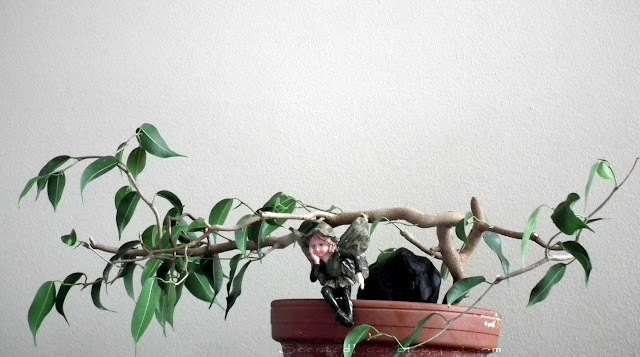 Actually this ficus Wiandi was left to grow almost untrimmed, because we did not decide yet in which bonsai style to stylize it ;-). Then he measured one ficus grown on a rock...but the whole set up: rock, training pot and the plant will occupies more space than his initial estimation. In the end he chose a group of 3 ficus benjamina variegated plants having almost 50 cm high, trained as miniature forest. 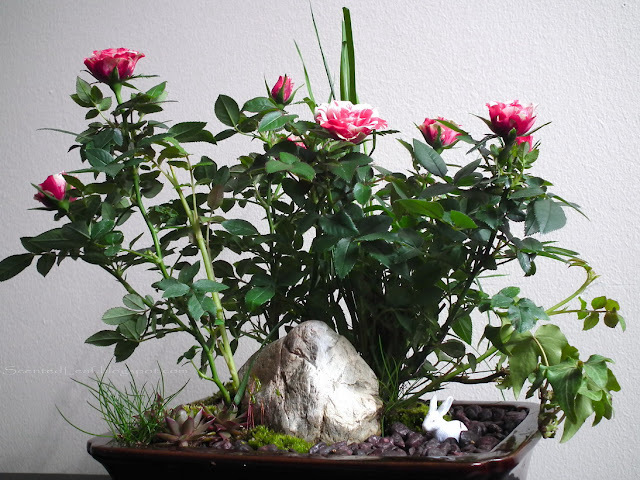 We taught him how to prune it regularly to keep it small in his terrarium, knowing for sure that in the tropical wet atmosphere inside the terrarium, the plant will grow very quickly (even the aerial roots will grow considerably in short time). The plants can be replant it anytime after they will adapt to the new climate in any dish or polymer clay pot he considers more appropriate with the decor (he has also inside some rocks for drainage, stones and untreated chemically free driftwood for landscaping accents). 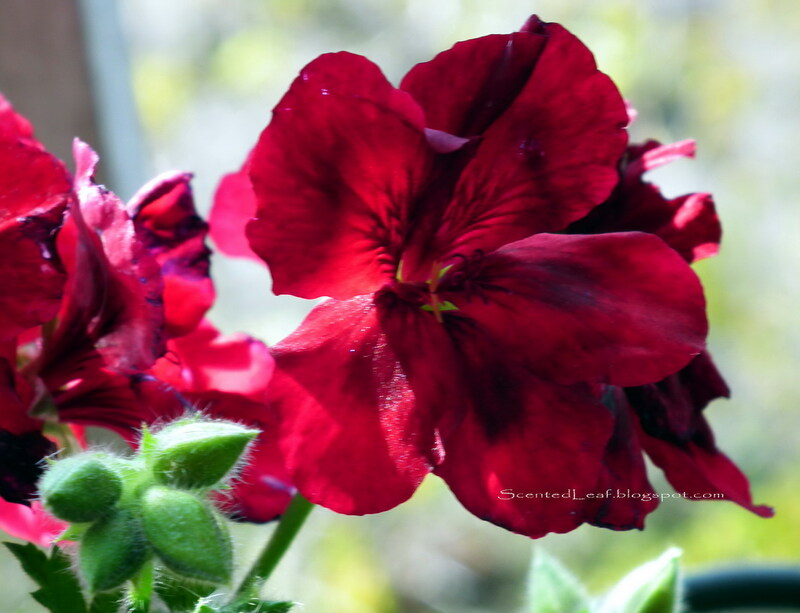 Growing pelargoniums / geraniums from seeds is a challenging and rewarding venture. 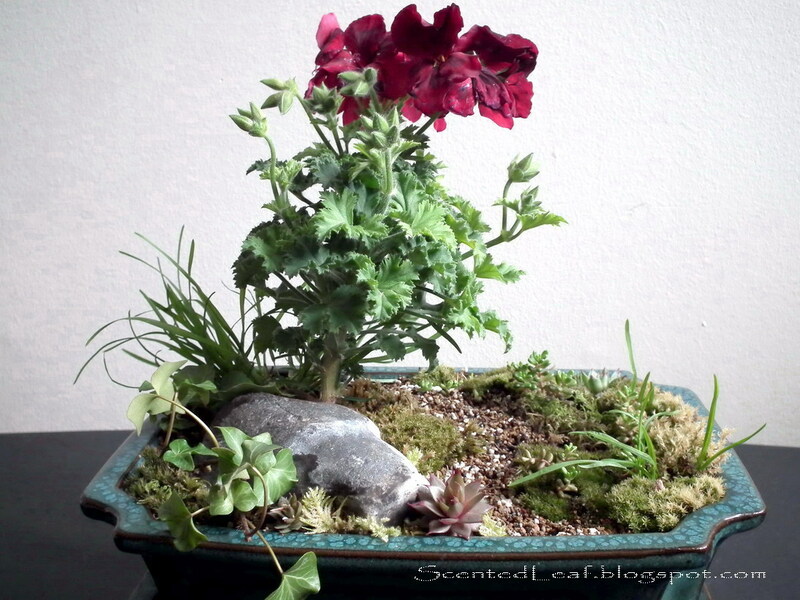 These little plants was born from the heart of the pelargonium seeds. They lay opened their small leaves so fast, and in almost two weeks had already 4 or 6 leaves. We used this time a different method to start the germination. 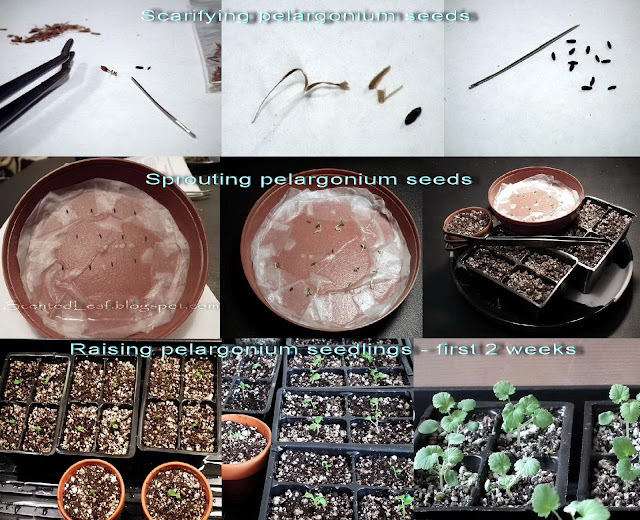 As I already told you in my previous post "2011 Pelargonium Seeds Exchange Project", we received 4 seeds of pelargoniums for this project: one seed of Pelargonium Alternans, one seed of Pelargonium Lobatum, one seed of Pelargonium Barklyi and one seed of Pelargonium Bowkery. In the project is specified that we should plant them using sprouting method (eventually scarifying them). So, before sprouting these seeds, we started with some of the pelargonium seeds collected from our garden last year, Prince of Orange and Frensham Lemon varieties. 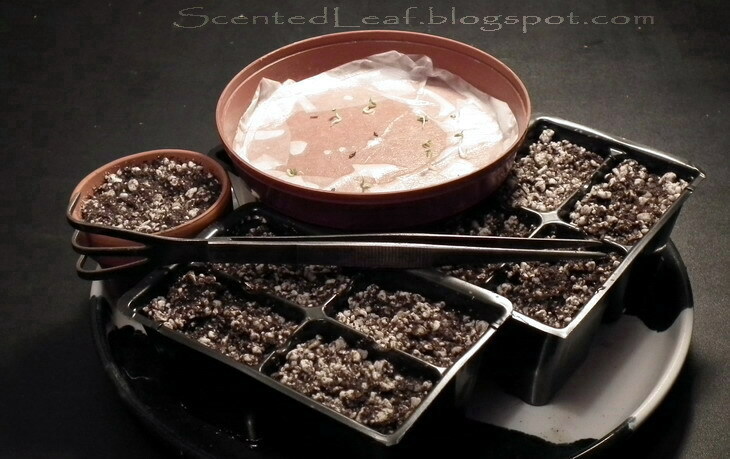 We removed the seeds from the mericarp, scratched them and placed them in a plastic dish on a moistened paper towel. Next 2 days the seeds were already sprouted and we planted them in a mix of sterilized peat moss, perlite and pumice. This method is more efficient than the method we used last winter for germinating seeds, the rate of succes being around 90% (last winter we reached only 55% success rate of raising new plants from seeds). The success prompted us to start the seeds from the project, too. We were also impressed by the accelerate growth of the little seedlings, perhaps because we removed the seed case after the seed germinated. We are keeping them in a small greenhouse, 10 hours per day under the growing light. In the last week we trained them for real conditions, letting them gradually without the lid few minutes per day (already 1 hour yesterday). Three weeks after germination, the little plants have more than 5 cm high and perhaps in one week, we will remove them from the greenhouse, growing them at the room temperature. My hobby to raise and carry for pelargoniums, geraniums whatever they are, was once again rewarded, don't you think?